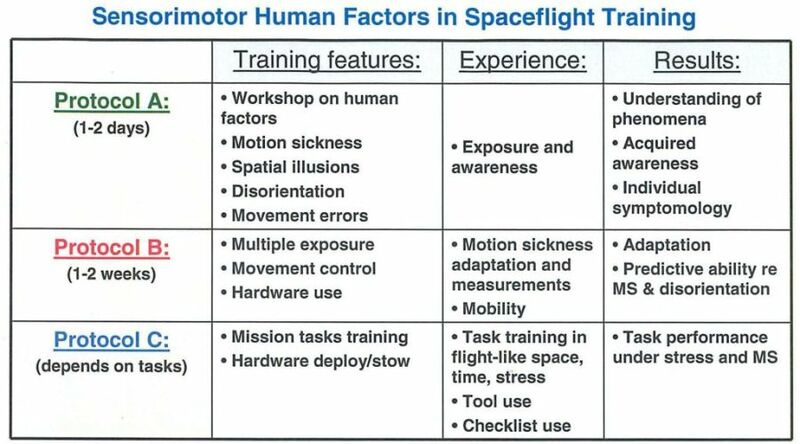 Training in sensorimotor human factors such as motion sickness, spatial disorientation, movement errors, spatial illusions, and movement control in artificial gravity environments. Protocol A: one or two days. Currently available. Protocol B: five days. Customized according to individual trainees' needs. Protocol C: up to five days. Customized according to individual trainees' needs. All trainees are required to have a valid FAA medical certificate, or equivalent. All persons who successfully complete the program based on our performance standards will receive a certificate of completion. The following terms and conditions apply to all training programs. Click here to read them. For scheduling please contact us at 781-736-2038, or email us!